I've been rereading Robert Graysmith's Zodiac Unmasked. Chapter Seven starts out with the report of a San Raphael graphologist who analyzed the Zodiac's handprinting. One of the things the graphologist hypothesized was this: "He puts himself under self-hypnosis consciously or unconsciously..." I'm not too familiar with the art of graphology, and I'm unclear as to how anyone could surmise such a thing based on a subject's writing/printing. 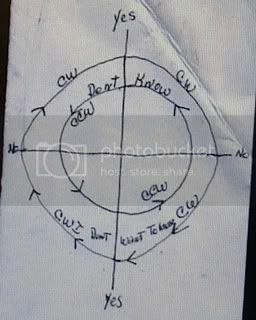 But it reminded me of one of the papers that was found among Jack's possessions: what Dennis refers to as "Jack's hypnosis symbol" (see below). 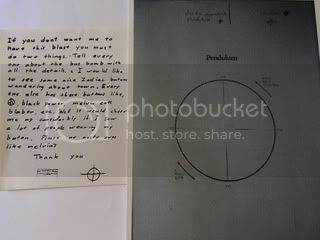 When I first saw this document, I was floored to realize that Jack had drawn the crossed-circle symbol and had -- for some reason -- hung onto this paper all his life. But I never really understood what the diagram was used for. JoAnne, the "cw" does stand for clockwise, and "ccw" is counter clockwise. Jack would hang a penny from a string and hold the penny over this symbol then he would ask himself a question, then whichever direction the penny moved would give him the answer, Jack claimed that this technique was a way to communicate with his subconcious mind. Jack was very heavy into self-hypnossis for a couple of years in the early 1980's, then something happened to Jack during one of his sessions, and it frightened him so much that he never practiced self-hypnossis again. The three 8/1/69 ciphers with Mirror J/Ts, FLOV(a)s:[IMG][/IMG] This is the last post for awhile but in August, my findings were only typed (Z-Letters&Stuff thread), so, that went by with a whisper. These were easily decoded, once looking for standout reversed/upside-down letters and the Mirror J/Ts. I circled most of them: 4 J/T combos, 3 reversed F's, 4 reversed L's, 8 colored-in O's, 6 upside-down V's. 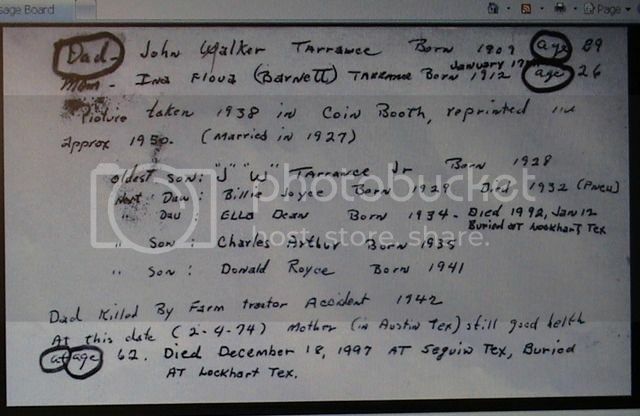 The Hardens may have deciphered it and LE claimed name wasn't found but Jacks name that's tattoo'd on him: FLOV(A) was there, and so is mirror J/T or John "Jack" Tarrance. It was there all along. Catseye, Keep up the good work with this thread. I would like to thank you for the accolades you have bestowed upon me regarding my possible solution to the "my name is cipher". I do have to say that I could be wrong with my solution but, after having looked at it several times, it just appeared to me the way a person stares at one of those pictures which are mainly comprised of multi-colored geometric figures or swirls (what are those pictures called?) for a long time then, BANG, they suddenly see the horse or, flower or, whatever it is that is hidden in the mosaic-like picture. Again, thanks for your support and, if I find anything else of significance in any of the other ciphers, I will let you know. By the way, I've been looking at that Donna Lass cipher and, I have noticed a few things but, it's still too early to see if they mean anything yet. Please bear with me and let my mind just wander. Take care. trustno1, you are welcome. I am seriously interested in seeing this thing through, so, my ego is set aside and I try to understand what others have contributed to this site. Some of these posts here went by without much attention because they got buried by other scene stealers. It's been the trouble with Dennis claims, I see, so, when he had something amazing and factual as far as incredible evidence to present, it was obliterated by the likes of Voigt & crew. That's been the same with this site even before I joined. A great theory, a great idea, a logical find....all of a sudden there would be other threads and even some rants, and that amazing solve would be lost in the foray. I am still searching this site for past posts that fit into this thread to make it easier for people to see why Jack is Zodiac, namely the puzzles being solved! By the way, I've been looking at that Donna Lass cipher and, I have noticed a few things but, it's still too early to see if they mean anything yet. Please bear with me and let my mind just wander. Take care. trustno1, how wierd that you are working on that cipher as I came across an old thread here (looking for puzzles solved by others) and, well, I came upon a potential solve by mixing old ideas and that cipher. I will be posting my solve shortly. Don't be put off by my solve as I think that Jack as Zodiac mixed word puzzles by adding cross word puzzles with cryptograms and word scrambles with word searches, etc, so, another solution is possible. Please post your thoughts on it here!! Anybody else have their ideas on this cipher....the theories, ideas, solves are welcome!! I had just looked at the Donna Lass Reward Cipher, came across the Mathematical thread and it hit me that there was a Greek D/Delta in that cipher. So, here's my solve: standout letter ONE colored in Greek D, only one E (reversed), only 2 N's and only one Y= DENNY. Add this to the fact that DENNY is a name of GREEK origin! So, did Jack understand the meanings of names, too? Using Greek letters like the D in the ciphers is just another clue as to who Zodiac is. Looks like this one is solved, too! Please see the 340 cipher edit Pg1 of this thread. Draven and margie11 were quietly on to something 9/08. [IMG][/IMG]from "Jack IS Zodiac - The Proof Thread"
"Ok, everyone who believes Jack is Zodiac needs to pick it up a notch. We have to start to talk about the proof that supports our claim. I have come to the conclusion that making statements like for example Jack was seen 2 miles away from the street where at 1am so and so was attacked, this does nothing for the case. Let's keep this thread for statements like for example Dennis is in possession of the hooded outfit Zodiac wore at LB(that is an example of a statement that would indicate concrete proof. This is a fictitious statement, Dennis is NOT in possession of the hood, just to clarify.) There is proof out there that Jack is Zodiac it is that proof that we the people who believe Jack is Zodiac have to dig up, if we don't this claim will never be taken seriously. So if you have non circumstantial proof, post it here and let's solve this thing." "Unfortunately, Diamond D, the only evidence that connects ANY of the suspects to the Zodiac is circumstantial. There are no matching prints, no DNA, no discovery of the hooded outfit the Zodiac wore at Lake Berryessa. If people were to limit their discussion of the case to non-circumstantial evidence only, there would be no message board by Tom Voigt, no Zodiac Unmasked by Robert Graysmith, no discussion of the case at all, really. Obviously, when some forensic proof comes along connecting Jack to the Zodiac, we will all be reading about it in the papers! This is not to say that Jack wasn't the Zodiac... just that there is no non-circumstantial evidence available at this time." "Joanne, I agree with you whole heartedly that everything there is in regards to the case is circumstantial, but I have been searching and searching for that one piece of concrete evidence that will point to ANY direction, but still nothing, the search continues and so do the theories and discussions..."
Well said DiamondD (and valenlee) way back in 2007. I believe these solves have helped reach the plateau that Jack IS Zodiac, so, thus the reason for this thread and these solves appear to be pretty decent, solid, non-circumstancial evidence that Jack IS Zodiac, so, hopefully no more "searching for that one piece of concrete evidence" as Jacks name, in so many forms, has been there in so many of the Z communications, it's unbelievable! 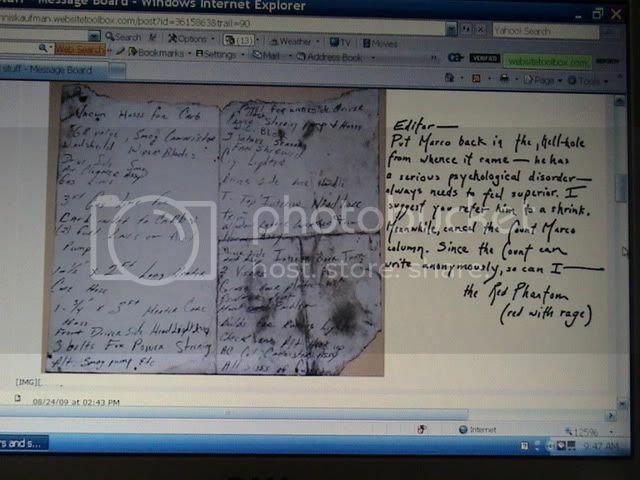 We have the handwriting match and I believe the hood was found, too! 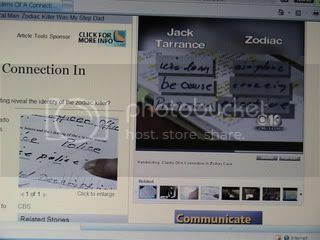 [IMG][/IMG] CBS13 Website and video clip of Nanette Barto doing Jack Tarrance & Zodiac Killer handwriting comparisons. 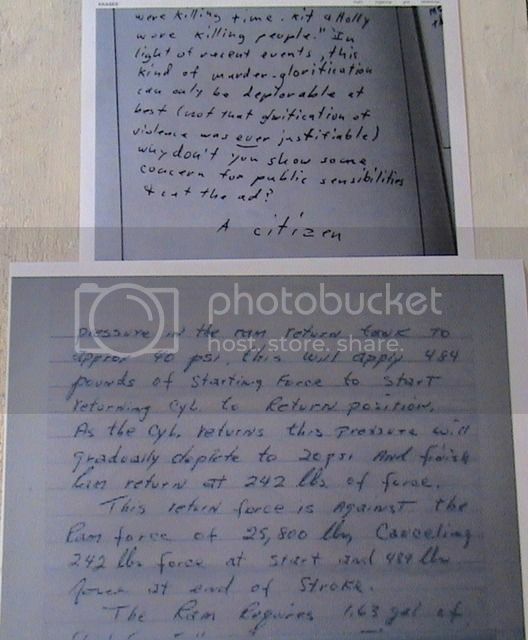 [IMG][/IMG] The top picture is a confirmed Zodiac Killer letter, the bottom is a picture of Jack Tarrance's early 1970s handwriting from Dennis Kaufman's "here is more handwriting" etc. thread. It is truly hard to tell the authors apart! Both look like Jack's handwriting to me! 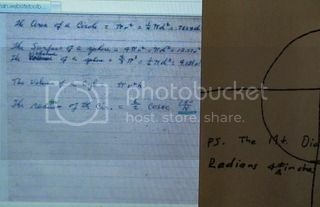 [IMG][/IMG] This is VinDecaturs Dennis Kaufman website find of an old Jack Tarrance handwritten paper comparing it to the Zodiac Killer Count Marco Letter. It shows a variant in style of Jack's writing that easily compares to Count Marco letter. 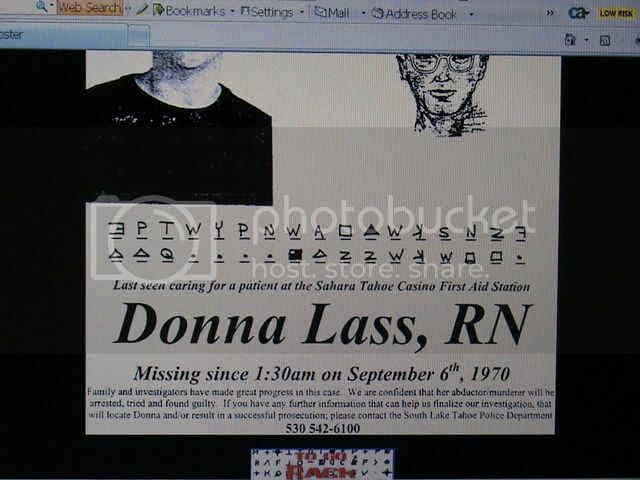 [IMG][/IMG] This is VinDecaturs Dennis Kaufman website find and it's my personal favorite of visual proof that Jack Tarrance looks to be the author of the Zodiac Killer letters as it has Zodiac's A's and the JT Bell Top ones, the N's the double L's and so many other "missives" that are clues to solving the puzzle as to just who Zodiac Killer was. AND IT's DATED 1974! From what I understand, there has been so many complaints that people didn't think that Jack's writing could match Zodiacs because of the "A's" and that Jack often used Bell Top lower case "A's" but as seen here, he comfortably switches style of that particular letter. So, add this to Nanette Barto concluding that even though Jack as Zodiac usually wrote his lesser common variant of the lower case "A" possibly attempting to disquise his handwriting, he eventually got tired and started his common trait Bell Top "A" at some point in the Z letters. BUT, these standout Bell Top A's of Jacks have been claimed to be altered among other letters recently, in order to disquise the author and SFPD held up the cases! I plan on this being my last large post for awhile. I have kept up this particular thread because the stats reflected at KKASES Photobucket say people are reading it. I hope that this thread makes it easy as ABCs to understand how to solve the Zodiac Killer riddles: codes/ciphers/puzzles, handwriting, images, etc, and come to the conclusion that Jack IS Zodiac. [IMG][/IMG] I see that Jack used Greek alphabet/symbols quite easily. 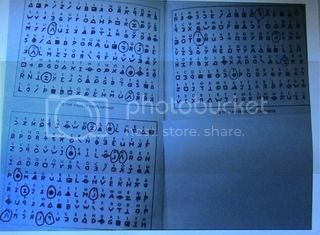 Please check out the Lower Case Tau's in Barnett in the previous posts genealogy paper picture. Also, the Capital and Lower Case Alpha A's, probably billowy B's or Capital Beta B, Capital Epsilon, the Greek San which looks like an M? and so on. I think Jack may have been of Greek heritage as his mom Ina Flova are Greek names, Denny is a Greek name, Tarrance may be Greco-Roman surname. The heritage may have influenced his handwriting. Jack freely wrote the Greek Alphabet when it came to his calculations. 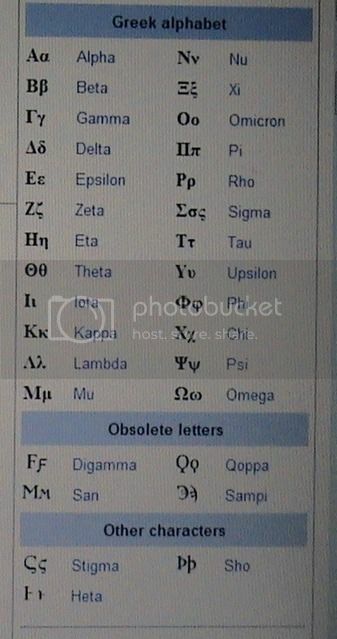 IMO, the mixing of the Greek and Roman alphabets is what makes Jack Tarrance the first and foremost, one and only suspect as Zodiac Killer out of all the others as Zodiac Killer did the very, same thing. Hey....and Lipstick Killer mixed the 2 alphabets, also!